Welcome to the Arizona Buffalo Slayers! : Thanks Wacky Left! The photo below captures a disturbing trend that is beginning to affect wildlife in the U.S. Animals that were formerly self-sufficient are now showing signs of belonging to the Democratic Party. They have apparently learned to just sit and wait for the government to step in and provide for their care and sustenance. 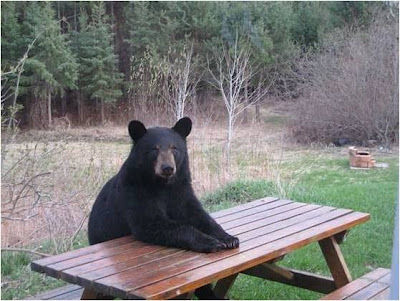 This photo is of a Democrat black bear in Montana nicknamed 'Bearack Obama'!